There is Nothing in the World we can't recognize. Optical Character Recognition at a Glance! 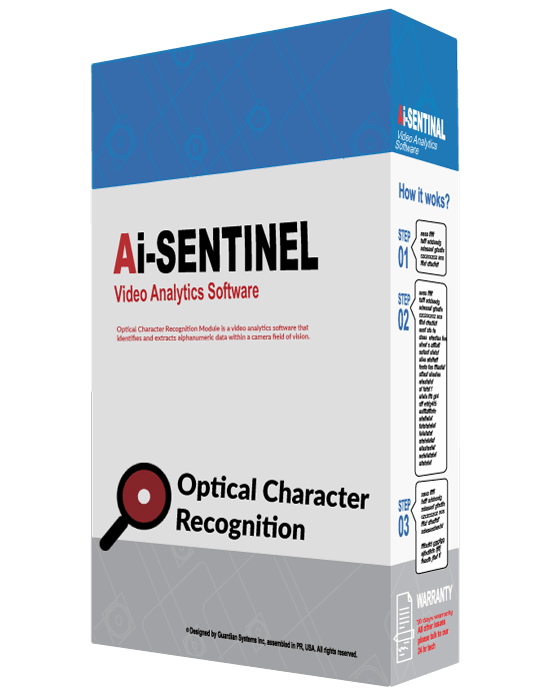 Optical Character Recognition Module is a video analytics software that identifies and extracts alphanumeric data within a camera field of vision. It identifies the specific characters in a set environment (“masking”) and extract the alphanumerical data. The software can be adapted to extract data from parking permit decals, employee ID’s, product decals, and more. Video management software for unifying surveillance streaming and maximize storage capacity. The data is extracted and incorporated into the database for operational or business intelligence purposes. The business intelligence dashboard is customizable to show the data required by the user in comprehensible reports and charts. Optical Character Recognition Module can be used with others modules at the same time. Video Management Software & Event Database. Included with People Detection Platform. The Guardian System approach to video storage event database is innovative and groundbreaking. Maximize storage capacity and keep only the events worth recording. Dismiss events and/or mark it as a false positive if appropriate. Post-incident reviews allow the users to keep track of all events ensuring an accurate account of viewed events. Save on data storage and bandwidth - video is streamed only when needed. Multiple storage options enable integrators to deploy systems anywhere including low/zero connectivity environments. The integrity of the recording is guaranteed by using a digital signal using protection algorism and cryptographic techniques. Customizable interfaces to view surveillance streaming from most Internet-enabled computers. Connect to most open IP cameras, systems, and mobile devices. Configure the settings and parameters of the video content analysis individually per camera to personalize it to your needs. Determine and configure the times the analytics will be activated. Identify specific areas of interests, persons to notify, and type of notifications. Determine specific property to safeguard. Create Regions of Interest (ROI) and Virtual lines within the scope of the camera vision to maximize the computing power and effectiveness of the system. ¹Yearly cost. Processing hardware, cameras, labor cost and other hardware are not included and can be quoted separately. Data transfer costs for notifications are not included are will be the sole responsibility of the client. Training of program to identify specific object or pattern (masking) required by client is not included and will be quoted separately. Masking may take 1-4 weeks depending on the complexity of the masking. ²Dashboard is made to order with the specific data analysis reports required by the customer. Reporting platform may take 1-2 weeks to compile and confirm from order. Notification functionality may be included in platform parameters. Consultation services are quoted on a case by case basis and can increase depending on the scope of the project. Receive upgrades and support any time. *Optical Character Recognition requires a 6-months software upgrade service. What is the Optical Character Recognition Module? It’s an AI module that identifies alphanumerical (Letters and Numbers) and extracts them to a database. It allows the AI to read any written information in the camera field of vision. What can the Optical Character Recognition Module be used for? This module can be used for taking information from an ID and automatically registering the data in the database, reading permits, signs, logos, ad many more. It is ideal for access control where visitor registration in required, production lines that need to register serial numbers and more. Can it be used with other modules? Yes. All our platforms can be used in together to create the perfect system to the User. As an example, the Optical Character Recognition Module can be used with the ALPR as double validation of both a license plate and the driver’s license.